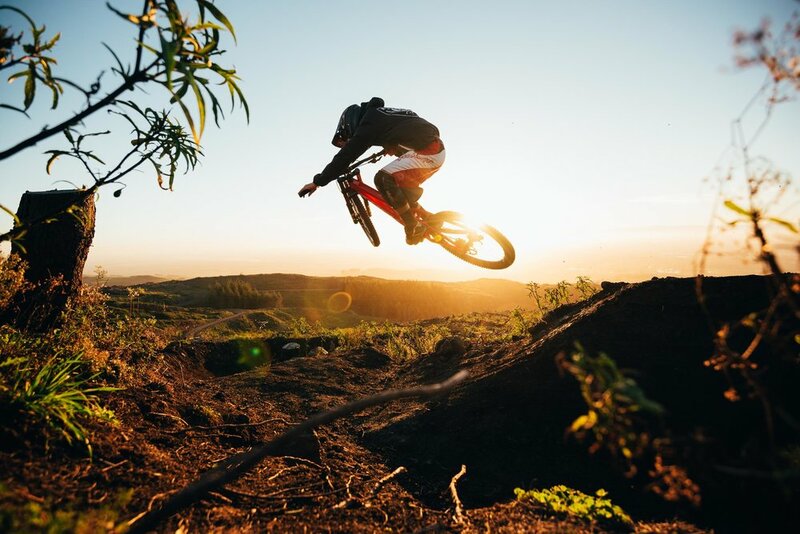 Christchurch is known as ‘the gateway to the South’, home to the second busiest airport in New Zealand and the place where many of New Zealand’s quickest mountain bikers call home. It’s a breeding ground for young talent, a trend which seems to be growing thanks to the Christchurch Adventure Park. By now, assuming you don’t live under a rock, you probably know that the Adventure Park suffered huge setbacks after the February 2017 fires on the Port Hills. The fire made its way into the woods and forced the park to close for roughly ten months, re-opening late last year. Large portions of the forest previously blanketing the hills are gone, exposing the trails to the elements, but also opening up the views and making for incredible sunset riding. The main thing is, it’s back up and running, it’s open every day, and it’s open to everyone. So, I’ve come to find out more about the how the Adventure Park is going, from the locals who work and ride there. I wanted to meet a couple of locals from different riding disciplines and backgrounds and get a real grassroots look at what the Park is doing for riders and for the community that surrounds it. First up, I met CAP ambassador Reta Trotman: Team New Zealand Commonwealth Games athlete, turned adventure racer, freshly back from competing in the Cape Epic in South Africa. Reta uses the park in a slightly unconventional way. Unlike most riders who would agree that the chairlift is the crowning feature of the Park, Reta prefers to make her way up the hill under her own power. When posed with the question ‘which is your favourite trail?’ her reply was “potentially the uphill trail; if not my favourite, then most often used”. 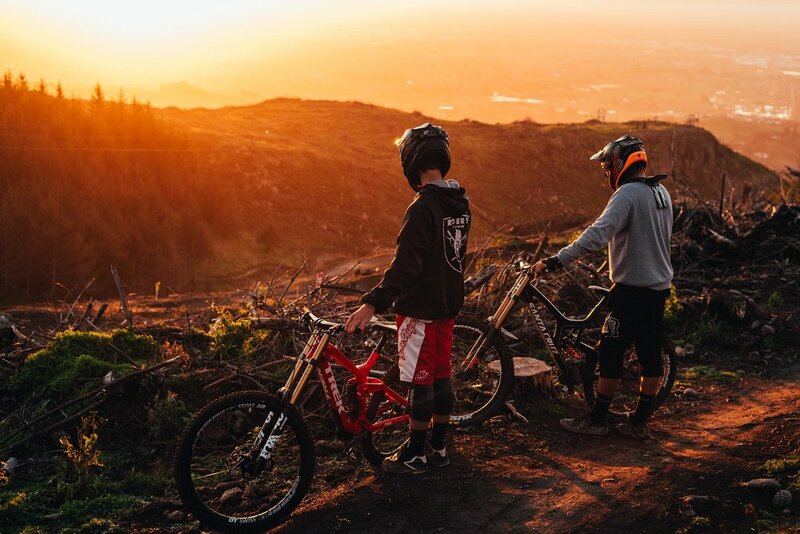 The next afternoon I returned to the Park to meet up with two familiar names in the New Zealand downhill riding community, young shredders Billy Meaclem and Boaz Hebblethwaite. These two would be using the Park in a contrasting way to Reta, as they’re known primarily for their ability pointing down the hill. I first shot with these lads as juniors racing World Cup Downhill in Europe, so it was refreshing to shoot with them on their home turf. Billy and Boaz know the Park intimately, as both are employed as trail crew, found with shovels in hand, or behind the controls of a machine, creating, shaping and repairing the tracks in the park. They are responsible for creating the trails that we all go to ride, so they can offer a unique perspective on how the park is used. Billy tells me that the park has been integral in his event training this year. “It’s a great facility for us athletes to train at for overseas events and a huge bonus not having to do shuttles up the hills anymore having a chairlift in place”. Basically, anyone who’s pedalled up to the top of the Port Hills will know that you can do far more descending when you don’t need to pedal up each time. Being able to concentrate on the downhill with all your energy in store is a real bonus for those wanting to build their DH chops. The flow trails put in place must have been quietly helping Billy on his pump track skills, as recently he saw success against the best in the world at Crankworx Rotorua and just took out the title of NZ Champion of the Red Bull Pump Track World Series. Both Billy and Boaz agree that having the park here presents a great opportunity for people wanting to get into mountain biking. “I think the park brings a huge amount of people to the hills that otherwise wouldn't have made it out to this awesome area just outside of Christchurch” Boaz states, and there’s the social side to it as well. “It's been beneficial for me for meeting up with people and smashing out a couple of fun laps most days”, which is something I can relate to also. There’s always someone there who you know, and there’s nowhere else you can have a coffee (or a beer) nestled in the pines and surrounded by bikes. Lastly, on Thursday, I caught up with World Cup XC racer, who’s lately become more of an enduro racer, fresh off the Gravity Canterbury series win, Craig Oliver. “For me, the park has been so beneficial for getting time on the Enduro bike. Laps on Laps, getting used to how you can throw this thing around. Big difference from the XC rig”. As an Adventure Park guide and coach, Craig gets to see first-hand who’s coming in to check out the park. “Never have I seen so many people of all abilities on bikes”. From first timers, to Pros, there is literally something for everyone. Not only now, but in the future as well. Craig points out the potential for future events at the Park. Internationally recognised events and races could easily find a home here. The vibe from the park is really positive. There are more trails open than before. The trail crew are out there building every chance they get. If you’re part of the Christchurch riding community, it’s nearly impossible to turn up and not bump into someone you know. They’ve got locals building the trails and they’re stoked to be there, as they get to be involved in what they’re riding. It seems that the chairlift is winning the poll for, ‘what’s your favourite feature of the park’ followed closely by what’s waiting at the bottom, with people turning up without bikes just to head for an after work beer or three. This will be the first winter that the park has been open in Christchurch, so it’s hard to know what to expect. Perhaps there may be a few more days riding for the weekend warrior, and a place for our young talent to hone their adverse weather riding skills. The Zipline is open again, and I’ve seen an increase in sightseers and walkers downloading on the lift. I’ll leave you with what Craig suggests for the best time when visiting the Adventure Park, and that is “one of Maree’s fresh date scones and a coffee. Before sending it down Airtearoa” - if you’ve got the skills, that is. First printed in issue 89 of the NZ Mountain Biker. Subscribe Today!